An almost metaphysical question which I have pondered when traversing a freezing cold highway at night on a noisy old motorcycle, or tried to explain to a non-rider over a glass of spirits. It is a question that may never have a definitive answer. 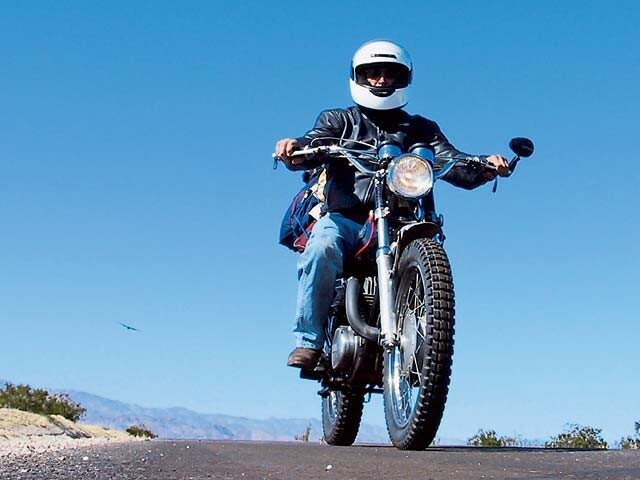 Why do we ride motorcycles? The converse is often easier to answer. Too loud. Dangerous. Messes up your hair. Bugs. Fear. The same reasons have been given FOR riding motorcycles. All of them. And then some. The mystique of the bad boy. The allure of the cowboy. The iron horse. Ride like the wind. Leader of the pack. A whole genre of Rock N Roll. Rockabilly. Those who do not ride simply cannot understand the attraction. Like so many things in life, the explanation means little unattached to the experience. I found a forum post that seems to explain it best. I was by a fellow who rode a postie bike from Sydney, Australia to the Ace Cafe in London which seemed to sum it up best. Dorothy is his name for his bike. Then something quite wonderful happened. I had a revelation. A turning point. Until that time I thought Dorothy was the trip and that unless I arrived in Dover grinning from her back then our challenge would have failed. It’s what’s been making me so nervous recently. This feeling that if for some reason she doesn’t make it then all of this will have been for nothing. There will be no triumph, just despair; a ‘nearly’ man once again. And then I thought; ‘wait a minute, Dorothy’s not a motorbike. She’s not even the person I’ve made her out to be. No, she’s a spirit, a mantra, a way of life. I lay there for a minute and then it hit me; we all have a Dorothy. Dorothy is that adventurous side in all of us, the one that says ‘the heck with this – I’m off’. She’s the one who has us dream and soar and think of all the wondrous things we should be doing. Sadly she’s also the one we suppress, dump on and say ‘no Dorothy, we need be more sensible than that.’ And so she sits there, in the corner of our minds being forgotten, never ridden. All I've done with this trip is spend some time with Dorothy. I've ignored all that holds us back and ridden like the raging winds. And so if this CT110, number plate 535DP were to drop dead in the gutter this afternoon I shall mourn the loss of a great motorcycle. One that deserves a place with a plaque noting its triumph. What I shall not mourn is Dorothy, for she will always live on, be it in the other motorcycle, bicycle or footwear that I carry on in. Because she is a spirit, my spirit, and no mechanical failure can kill that. That, my friends, is why we ride.